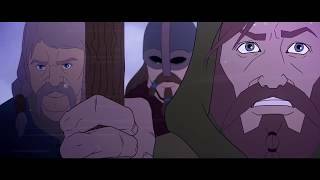 Versus Evil and Stoic have announced that the third and final chapter in the Viking RPG trilogy, The Banner Saga 3 will launch on July 24th, 2018. There will be three digital versions of the game at launch. The Standard Edition on PC will cost $24.99, while the Deluxe Edition will be priced at $29.99 and will include the game’s official soundtrack composed by Austin Wintory in addition to a digital wallpaper, world map and the ‘Gold Wasp’ in-game title. 505 Games will be publishing a physical retail package – The Banner Saga Trilogy: Bonus Edition - for both Xbox One and PlayStation 4 priced at $39.99. The Bonus Edition will include Banner Sagas 1, 2 and 3 plus a mini art book, poster, best of soundtrack and in-game digital item. A digital PC Bonus Edition featuring all three games will also be available. The Banner Saga 3 will be released on PC, Xbox One, PS4, and Nintendo Switch. There are currently 0 members and 121 guests on the website right now.